To be frank with you, I'd really rather skip January and move on to February if I can have it my way. After the Christmas mayhem topped by a full on four course dinner the night before New Years Eve, I looked at the calendar, blinked twice, almost had a panic attack and sighed. Chinese New Year tickets home are booked and I have two weeks to get the house - including a rather unsightly room - in order before I can board my flight in peace. I'm not sure there will be time for Lunar New Year cookies this time. In any case, I think I'll play safe and not make you any promises. In the meantime though, let's forget about the pressure of the impending Gong Xi and dwell a bit more in the first few days of 2012 by talking about these little dark, dainty things filled with some of the best flavors in my books. 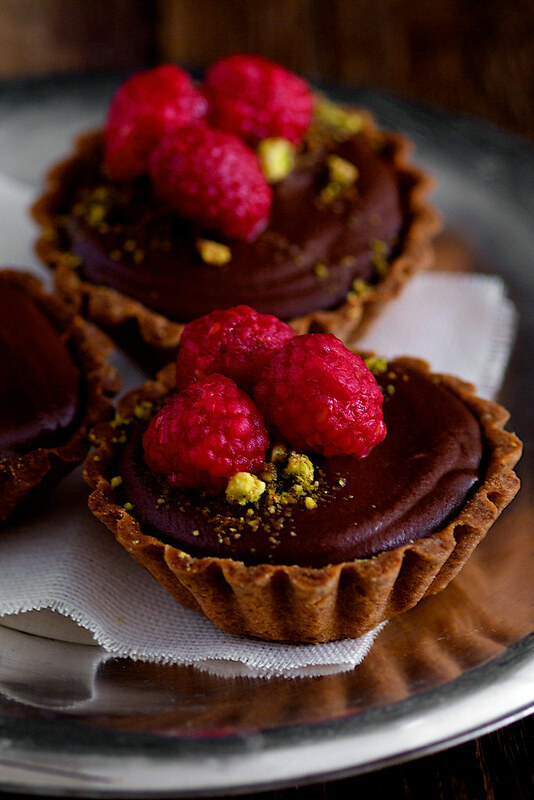 There were leftover tart shells lying around after I made these. Just as I was contemplating to eat them all up, my friend Najah asked for tarts as the dessert during our nasi ambeng cookout a few days after. 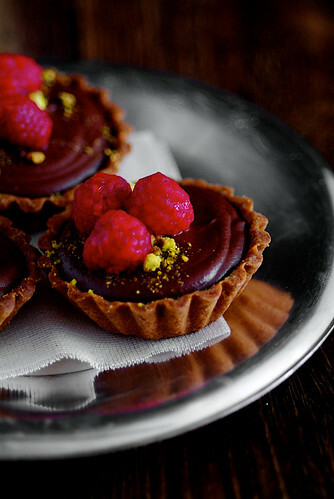 "Raspberry and dark chocolate tarts", she was very specific. Something light, in small doses, which we would still be able to manage after the communal feast of rice, spicy soy sauce chicken and various fixings without going into a coma on the couch or falling asleep on Kevin Spacey at the evening's play of Richard III. If you've been hanging out here for awhile, you'd know that I'm not very good in keeping things light. 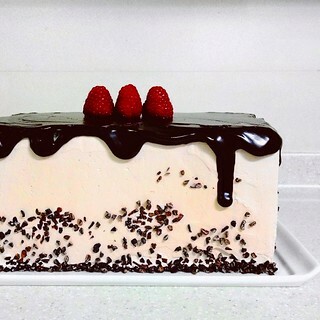 If it was to be a feathery something sweet, I'd show up with a pavlova, chocolate, nuts and all. But no, Najah wanted tarts. And I needed to get rid of tart shells good enough to eat on their own. So I presented these and suggested we eat them before dinner. It was a good move. While the raspberry jam and pistachio did cut some richness out of the whole ensemble, the dark chocolate ganache gave us no illusions of its smack down role. These are like the antithesis of the lime curd ones - you will need to sit down for it, with a cup of coffee, and try not to roll over after eating one. When Meesh came to dinner last week, I made these again. This time Najah pointed out that they were 'pregnant' (I filled them a bit high) and Meesh accused me of feeding her desserts fit for the Queen of England. Given that I haven't seen Meesh for about six years and it was Najah's fault this creation came into fruition in the first place, I didn't mind the dramatic feedbacks (though I highly doubt HRH would prefer this over, you know, scones and clotted cream). The tarts were not to be blamed, although they meant business. It was the dinner I fed them - you know your mission to feed was accomplished when your guests started asking for pillows. Had it not been for my own nouvelle année resolution to fit into my old clothes, I would've eaten two as we bantered over Malaysian politics and current issues till three in the morning. I wasn't all that victorious though, the next day, alone at home on New Year's Eve, I ate two. Did your New Year begin with a bang? If not, let me present you with a win-win grand plan. Make some of these, steal one (or two) at the end of the day after your eat-healthier soups/grains/greens, hold a couple back for emergencies, then shower rest on your unsuspecting loved ones. Pâte sucrée and chocolate ganache recipes adapted barely from the Australian Gourmet Traveller. Yield: About 21 3-inch tartlets, 24 if you roll the pastry exactly 2mm thick and divide the filling accordingly. Note: For pâte sucrée tips, you may refer to my previous tart recipe. Macerating the raspberries is optional but I like to do it because it balances out the tartness of the berry and the syrup gives them a nice sheen. Prepare the macerated raspberries: For the macerated raspberries, in a non-reactive bowl, coat the raspberries with the sugar. Cover with cling wrap and let stand at room temperature up to 6 hours. Drain off excess syrup before using. Make the pâte sucrée: Process flour, icing sugar and a pinch of salt in a food processor to combine, add butter and iced water, process until mixture resembles fine crumbs. You can also do this very quickly with a pastry cutter. Add yolk, process to combine, turn onto a work surface and bring together with the heel of your hand. Divide the dough into 2 balls and form each dough into a disc. Wrap each disc in plastic and refrigerate, for about 1 1/2 hours. Prepare the jam and nut filling: In a medium saucepan, place all the ingredients and cook over medium heat till jam thickens slightly, stirring constantly with a wooden spoon, about 20 minutes. Remove to a bowl and let it cool to room temperature. Cover with cling wrap and refrigerate (if necessary) till needed. For the pistachios, spread them on a baking sheet and roast for 10 minutes in at 180°C or 5 minutes over the stove. Cool to room temperature. Process in a grinder or pound in pestle and mortar, leaving some coarse pieces for garnish. Bake the tart shells: Preheat oven to 180°C/350°F/gas mark 4 (if using convection, turn the fan on). Working with one dough disc at a time, divide dough into 8 pieces. Roll out each piece on a lightly floured surface to 2mm thick and line 8 3-inch-diameter, 3/4-inch-deep fluted tart shells. Trim edges and refrigerate to rest, for about 30 minutes. Reroll remaining pastry into a ball and return it to the fridge. Repeat with the second dough disc. Combine the leftover dough and repeat to line remaining tart shells till all the dough is used up. Blind bake tart shells (pierce, line and weight) until light golden, for about 15-20 minutes. Remove paper liners and weights, brush shells with egg wash. Bake again until crisp and golden, about 4-5 minutes (if using convection, turn the fan off). Remove pastry shells from tart tins and cool on a wire rack. Prepare the ganache filling: Bring cream and corn syrup to the simmer in a small saucepan over medium-high heat. Remove from heat, add in the chopped chocolate and stir until smooth. Remove into a bowl and let cool slightly. Refrigerate until slightly thick, about 25-30 minutes, stirring every 8-10 minutes. 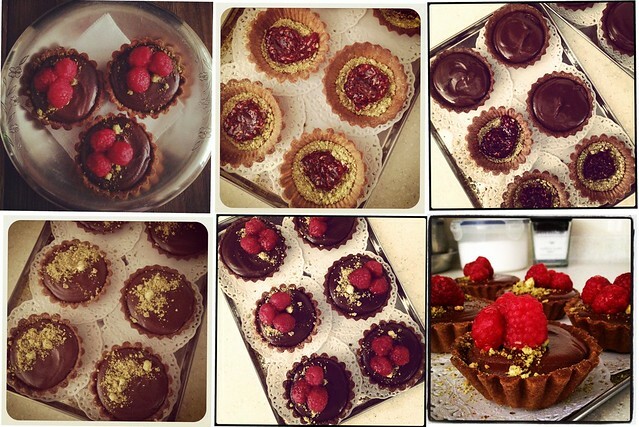 Assemble the tarts: While waiting for the ganache to cool, arrange the tart shells on a baking sheet or tray. Fill each shell with about 1 tablespoon of ground pistachios. With a small ice cream scoop or a tablespoon, scoop and fill each tart with the raspberry jam. 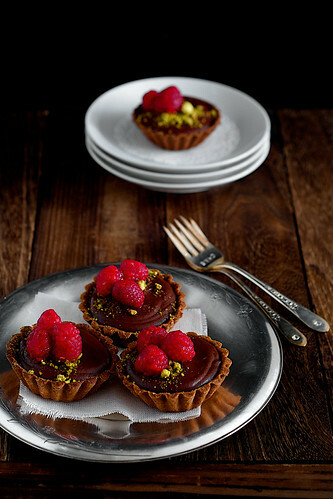 Then, fill the tarts with cooled ganache, smooth the tops if necessary. Refrigerate for about 15 minutes to set. Once ganache is set, sprinkle with some pistachios. Arrange 3 to 4 of the macerated raspberries on top and serve. 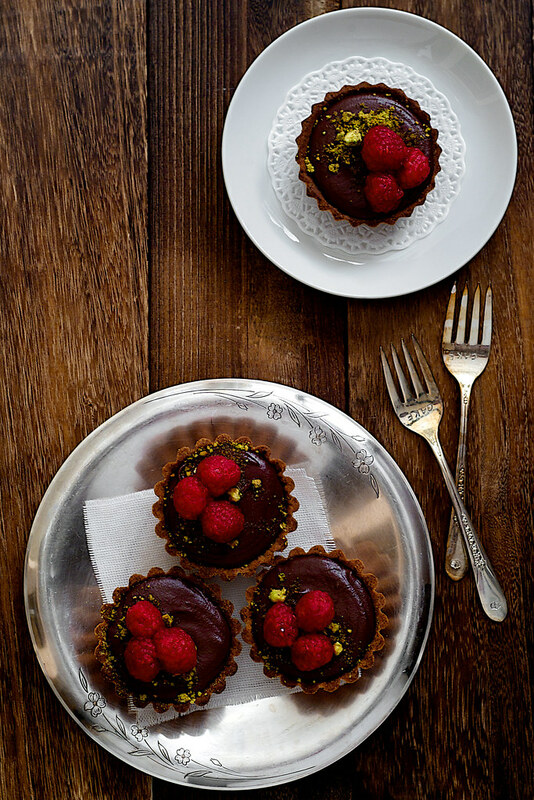 Do ahead: Assemble the tarts as close to serving time as possible. 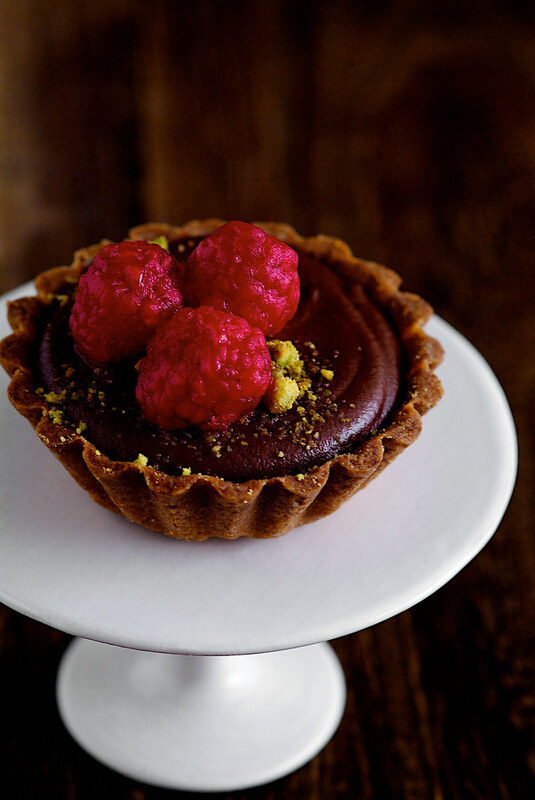 However, all the components of the tart can be prepared ahead, except for the ganache. Baked tart shells keep well in an air-tight container, with layers of parchment in between, at room temperature, up to 3 days. The jam keeps up to 1 week, longer if canned. 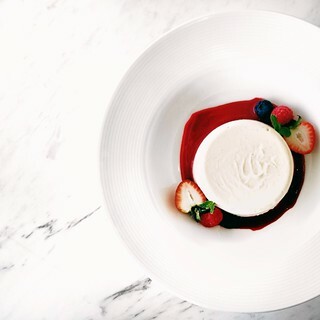 Keep the maceration of the berries under 8 hours though, else they'd be too soft to use as the garnish. These look absolutely delicious and the perfect reward after a virtuous healthy supper ;) I love the flecks of pistachio and the chocolate filling looks divine. Beautiful tarts Pick Yin. The tart case actually looks like it has chocolate, love the hue. It reminds me of Careme's chocolate shortcrust pastry. Hope you had a great Christmas and New Year! 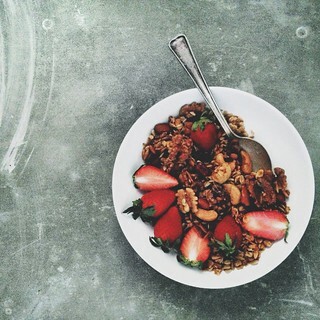 thelittleloaf: I use pistachios whenever I need to use nuts for any desserts. The green is so vibrant in the fresh ones. anh: I have to take leave and go back to KL. Not looking forward to it. Sneh: Thank you. 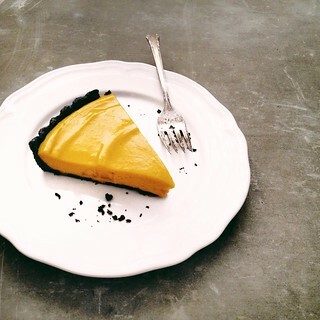 The tart case is delicious, I can't get enough of this sweet pastry! It's easily modifiable to include chocolate and nuts too. Happy New Year! Totally lusting after these now! Mind you I just had a heavy lunch! Pei Lin: Okay, will make this for when we have our next dinner party. I lust after them too!